Certain skin conditions such as acne often start in the teenage years while other issues like actinic keratoses develop with age. Fortunately, Photodynamic Therapy (PDT) exists as a treatment that effectively controls both teenage acne as well as actinic keratoses. An actinic keratosis is a pre-cancerous skin lesion, which forms as a result of prolonged exposure to ultraviolet rays, usually from the sun or tanning beds. An actinic keratosis usually appears as a rough (like sandpaper), red patch occurring in areas of sun damage. Often times, patients will describe these patches as “getting worse in the sun.” If left untreated, an actinic keratosis may turn into a squamous cell carcinoma, a type of non-melanoma skin cancer. PDT is a treatment which uses light to destroy the abnormal pre-cancerous skin cells that cause actinic keratoses. The procedure is performed in three steps, starting with the application of a topical photosensitizer, which is left on the skin for a period of one to three hours, depending on what your Dermatology Provider deems is necessary. This first step is known as the “incubation period.” After the incubation period, the photo sensitizer is activated by the wavelengths from a blue light source. During this 15-minute activation period, patients may feel a tingling or warm sensation. Following activation, the area is then treated with an emollient cream and the patient is free to go home. PDT will cause a reaction in the skin that leads to tenderness, redness, and swelling immediately following the procedure. Peeling occurs for the next 3-4 days, and most individuals have normal skin by 7 days after the procedure. Depending on the severity of the patient’s condition, multiple sessions may be required to achieve optimal results. Photodynamic therapy is a medical treatment that is often billed to insurance for actinic keratosis. Coverage will depend on the patient’s particular plan and benefits. How Does Blue Light and Photodynamic Therapy Treat Acne? Blue light therapy alone is a non-invasive treatment that controls moderate acne without the need for antibiotics. This procedure uses advanced blue light technology to kill the bacteria that can contribute to the inflammation found in acne. During this treatment, patients sit with their face close to the blue light source for 16 minutes. There is no recovery period and no downtime as compared to PDT. 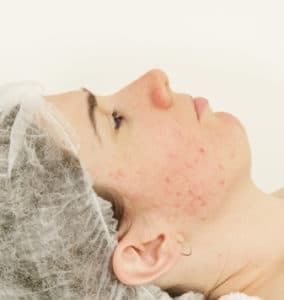 PDT (Blue light therapy combined with aminolevulinic acid as mentioned above for the treatment of actinic keratoses) can also be used to treat more persistent and severe acne. Approximately four treatments of PDT may be as effective as a course of isotretinoin. Once again, there is a period of downtime to PDT compared to blue light alone. However, PDT offers a potentially effective alternative to isotretinoin for disfiguring acne.